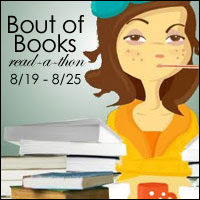 For the Bout of Books Read-a-Thon I'm going to try for three books, at least. The three are listed below. If I can squeeze in more books, ok. I'm just want to have fun reading. Typically reading three books in a week would be easy, but this coming week is going to be busy, so three is kind of a challenge. Hi Faye! Thanks so much for the info. This is my first Bout of Books. I appreciate the help! I've been enjoying seeing what other people have posted. Janie, Good luck with your 4! Thanks. Happy Reading to you as well!